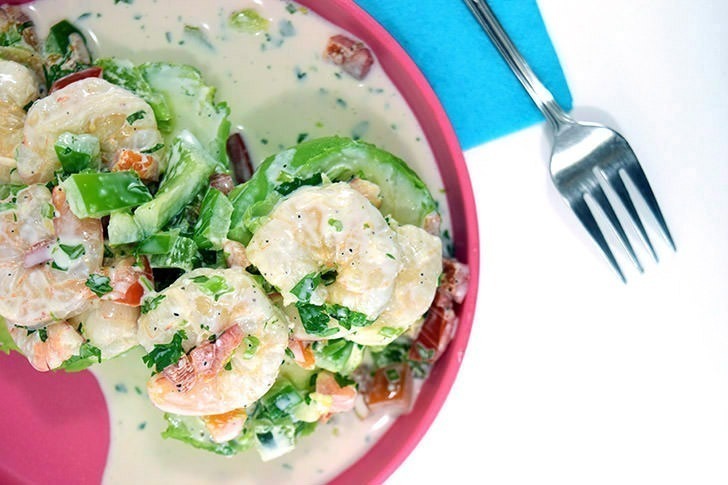 15 minutes is all you need to whip up this shrimp salad stuffed avocado with homemade dressing. It makes a fabulous starter or a tasty quick lunch! Sometimes I instigate going out to eat. I can only recall a single time he ever responded to my “hey, want to eat out tonight?” with a NO and I’ve got to tell you, I’ve gotten so used to yes that I was pretty darn perturbed. On this particular day in history, I had had a very bad yesterday. It was so bad that Rob owed me and so he took me out someplace nice. I had been to this one restaurant once before for a business meeting and I really liked my meal. The waiter didn’t think so because I only ate about half of it (what?! I was full! ), but truly it was the best plate of shrimp tacos I had ever eaten. And on my second visit I ordered the exact same thing. Rob order his own tacos and as we waited for our food we saw this avocado thing being delivered a few tables over. Rob waved the waiter over and learned it was a “stuffed avocado”. We ordered one and when we got the bill after realized it was a $14 salad. Wowza! Boy was it good. Just not $14 good. And so we talked on the ride home about how it wasn’t that crazy of a thing to make ourselves and that we could develop our own recipe. I set to the task and, as it turns out, my recipe is just as good, if not better, and costs us half the price for 2 portions AND we each get 8 ounces of shrimp. That’s a LOT of shrimp :) Recipe worked out, Rob was my first ever recipe tester and he actually whipped up the dish you see in the pics from the printed directions I gave him. He did well, right? 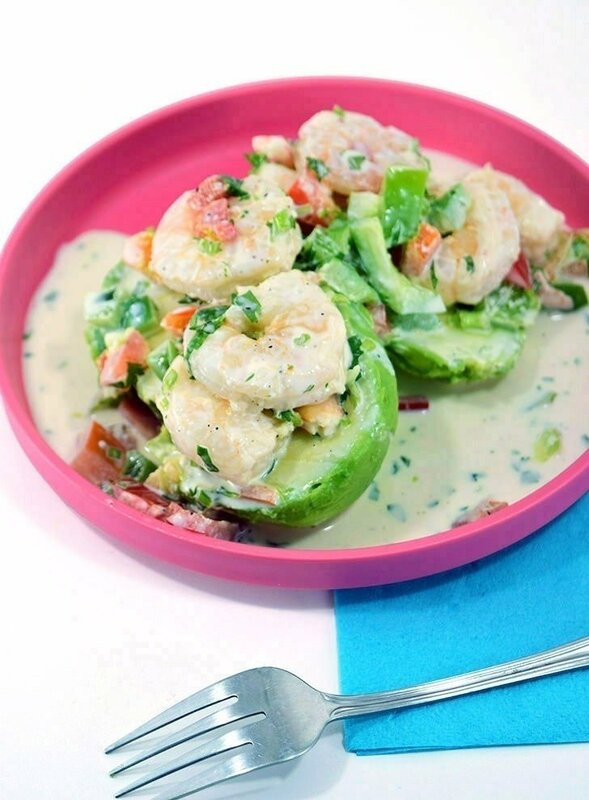 This Shrimp Salad Stuffed Avocado Recipe makes a perfect starter for your meal or when added with something light like fresh fruit or a mixed salad the perfect refreshing lunch. It’s an especially welcome supper after a hot day at the beach! It is a bit rich, a little decadent, so you’ll definitely want to serve your stuffed avocados with something so that all of that richness doesn’t get overpowering. Tired of hearing about it? Want to make it? This refreshing and cool salad is perfect for a hot day and is just about my favorite lunch when served with a side of fresh fruit. All in, this recipe can be whipped up only 15 minutes and everything but the avocados (which oxidize and turn brown) can be prepared in advanced making this meal even speedier! Combine dressing ingredients and allow to rest in the refrigerator at least several hours for the best flavor. In a large bowl combine shrimped and chopped veggie tossing to mix together well. 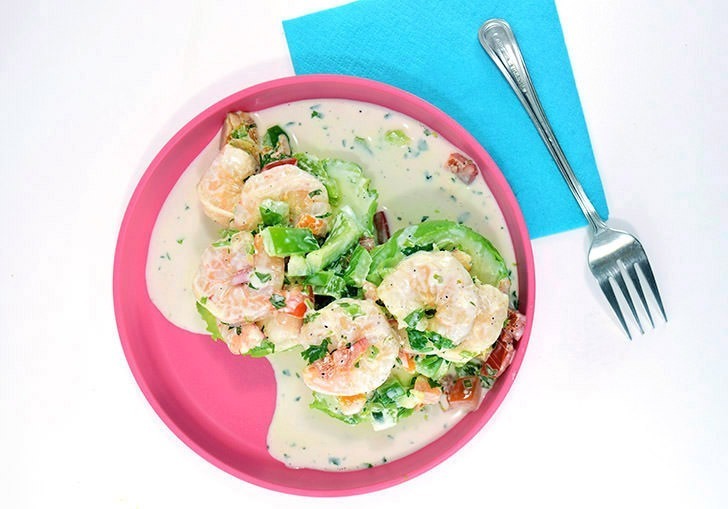 Add dressing to shrimp tossing to coat well. Halve avocados and remove pits. Using a large spoon, pull the meat of the avocado out of its shell (hopefully in one, attractive piece :). Rest on a plate and heap an overflowing amount of shrimp mixture on top.